What? Where? and When? That is precisely what you can find out when you visit When.com the fairly new hyper-local site created by AOL. When.com can help you to cut through the clutter and pinpoint restaurants, events and activities in your neighborhood. It also offers the ability to buy tickets and save on dining out with dining deal offers. When.com enables anyone to add an events to extend city event coverage. For example, check out the listing for TECH cocktail DC 5 in Washington, DC today. I recently got a chance to talk with Abha Dasgupta about When.com in episode 78 on SOMEWHAT FRANK adventures in personal technology. Also check out the full TECH cocktail DC 5 preview. DEMO 08 was a blur of excitement and adrenaline as 77 companies showcased their stuff in front of the tech world. 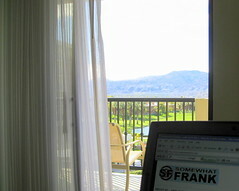 I pulled together roundups for Day 1 and Day 2. Now I want to look back and express the launches that I found the most interesting. Please keep in mind that there might be some great products that I left off this list because I could not relate to them as well as the ones on the list. If you attended DEMO 08 please drop a comment below and let me know which launches were keen on. This week I got a chance to sit down with AOL's Kevin Lawver who is very well respected at AOL and in the web development community. He has worked at AOL for 13 years and worked on everything from AOL search to conceptualizing and developing Ficlets, previously covered here. 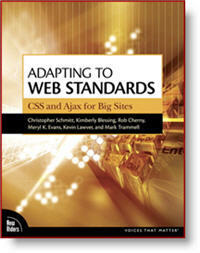 We sat down and discussed a new book Adapting to Web Standards : CSS and Ajax for Big Sites which he helped Christopher Schmitt, Robert Cherny, Meryl K. Evans, Mark Trammell and Kimberly Blessing author. The book is devoted to helping experienced developers to better understand the changing web standards landscape and somewhat frankly, adapt. Kevin wrote chapter 7 which focuses on AOL's move into the online space with the relaunch the new AOL.com in 2005. The chapter discusses managing "corporate swirl" and "combating the waterfall" methodology. It even refers to web development as a craft (not witchcraft though).